LEFT Members of Teter Cycling hold up the 2019 women’s Little 500 trophy April 12, at Bill Armstrong Stadium. Delta Gamma placed second, and SKI placed third. RIGHT The Cutters pose with the Borg-Warner Trophy after winning the 2019 men’s Little 500 on Saturday at Bill Armstrong Stadium. More photos from last weekends race can be found on page 7. APRIL 23 & 24 NEXT TUESDAY & WEDNESDAY! Jill Lees, the new chief of police of the IU Police Department, is sworn in by Benjamin Hunter, the associate vice president for public safety and institutional assurance, April 11 in the University Club of the Indiana Memorial Union. Lees previously worked with the Plainfield Police Department as the deputy chief of support. The Indiana Memorial Union's University Club room was full of friends and colleagues of new Indiana University Chief of Police Jill Lees Thursday evening during her swearing-in ceremony. These companions, new and old, watched as associate vice president for public safety and institutional assurance Benjamin Hunter swore her in and Lees' fiancé Paul Tutsie pinned her new badge on her lapel. Bloomington City Council organized a meeting April 10. City Attorney Michael Rouker explained Ordinance 19-09, hoping to add a new chapter regarding regulation for motorized scooters. cover their coughs and sneezes. The Indiana State Department of Health said the cases are not widespread enough to issue a campus-wide clinic, Carney said. However, a vaccination clinic was offered at the fraternity last week for students who may have been in close contact with the members who had been earlier diagnosed, he said. Mumps is an infection that can cause swelling in the salivary glands, according to Mayo Clinic’s website. Other symptoms include fever, headache, muscle aches, tiredness and loss of appetite. Symptoms can appear 12 to 25 days after infection, according to IU’s public safety advisory email. People with mumps may be infected from two days before until five days after the symptoms begin to appear. Some people may not have symptoms. The Indiana Daily Student publishes Mondays and Thursdays throughout the year while University classes are in session. 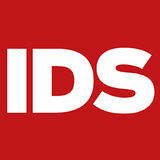 Part of IU Student Media, the IDS is a self-supporting auxiliary University enterprise. Founded on Feb. 22, 1867, the IDS is chartered by the IU Board of Trustees, with the editor-in-chief as final content authority. The IDS welcomes reader feedback, letters to the editor and online comments. Advertising policies are availale on the current rate card. Readers are entitled to single copies. Taking multiple copies may constitute theft of IU property, subject to prosecution. Paid subscriptions are entered through third-class postage (USPS No. 261960) at Bloomington, IN 47405. Dave Rollo, 57, is now running for his fifth term on the Bloomington City Council in District 4. Rollo was the first person to introduce the concept of sustainability to the city government in 2002.
adding density and affordable housing. She is an owner of a fourplex and does not think they would fit in with many of the core neighborhoods. “I’m a huge supporter of that kind of housing, but they have to be put in the right places,” Sorby said. She said when a neighborhood in Rollo’s district requests something like better rainwater infrastructure or a trail for better connectivity, he responds quickly and follows through with helping them. Members of Chi Alpha handed out free water bottles Thursday, Friday and Saturday nights to partygoers at known drinking locations throughout Bloomington in honor of Little 500 weekend. chugged the water like a Smirnoff Ice. People began heavily streaming out of one fraternity, and the Chi Alphas moved toward them. Two men came up to the group. They greeted the Chi Alphas and began talking. Get news headlines sent to your inbox. “I’m a senior,” one said. He paused and smiled. “In high school.” He chatted with the group and asked them who they were. Eventually, he asked his friend if they were going to walk or Uber home. They decided to walk. “Don’t trip,” a Chi Alpha called out. “Thank you,” he said. “I love all you motherfuckers.” Around 12:30a.m., North Jordan Avenue grew quiet. The neon party lights had been turned off and the thumping bass was gone. A group of men in jerseys and baseball caps smoked cigarettes outside. A few girls took pictures, their flashes briefly lighting up the darkness. Most partygoers were gone. Maybe they were staying the night at the fraternity, maybe they’d found their way to another fraternity party, maybe they’d gone home. It didn’t matter. The party was over. A middle-aged woman pulled up in her car and waited outside the fraternity for someone to get in her Uber. A Pizza X driver stopped in front of the fraternity to drop off a pizza, a sure sign the party had officially ended. A Chi Alpha gave the driver a water bottle, and a few minutes before 1 a.m., the group made its way back to its original location at 17th Street and North Jordan Avenue. By 1:15 a.m., even the car traffic waned and the Chi Alphas decided to call it a night at the North Jordan Avenue station. The group loaded the unused water bottles into a truck and gathered to pray. They thanked God for allowing them to help people and prayed they could continue sharing love. “Amen,” the group said. As they drove off, nothing was left on North Jordan Avenue but the sound of a distant police siren. Chi Alphas and partygoers alike went to bed, prepared to do the same thing tomorrow for the men’s Little 500.
than 200 Ivy Tech classes transfer to IU Bloomington. or get ahead on your fall semester! the most affordable in the state at $137/credit hour. Crimson Cupboard — effectively salvaging and distributing unused food Michael Skiles is a sophomore in cinema and media arts. Cupboard to help provide these students with the food and basic necessities we all take for granted. People come to college in search for a better life, and in some situations, they’re not able to afford housing or even food. Some of these students have no other option than to live out of their cars. Imagine waking up, going to class, working for your degree and ending the day by searching for a place you can park and sleep without getting hassled. These students have come to get their degrees as quickly as possible and are remarkably determined to do so. Even if it means they must endure such harsh living conditions. Pate is doing her part to spread awareness for these students in need. Pate hopes to bring representatives of the Crimson Cupboard into the fraternity house during a dinner to help the students realize just how thankful they should be for the food in front of them in and roof over their heads. She hopes the presentation will inspire them to give and help in any way possible. “I’m hoping that a lot of these young men that don’t think about where their next meal is coming from realize how lucky they are,” Pate said. “They see these students on campus, and they don’t advertise that they’re homeless or need to find somewhere to take a shower. Jaclyn Ferguson is a sophomore in journalism. Sean gave emotional performances to honor the fallen rapper. Rival gangs came together for the first major widespread cease fire since the mid-1990s. California Rep. Karen Bass tweeted that she will “be heading to the House Floor next week to formally enter Nipsey Hussle’s contributions to South Los Angeles into the Congressional Record where it will be a part of United States history forever.” The Nation of Islam led a march for unity in South Central L.A. saying it is the “first time in the history of Los Angeles that we have stood up when a black man kills another black man.” A petition was created on change.org to get Crenshaw Blvd. and Slauson Ave. to be Nipsey Hussle Blvd., and it recently gained enough momentum to succeed. The name of the intersection was changed to honor him. His mark on the world goes far beyond music, and there is much that can be learned through his community engagement. He was the epitome of “keeping the dollar in your community,” and people need to recognize how powerful that notion truly is. He was an advocate for ending gun violence, specifically gang violence. Our country needs ranked-choice voting Jonah Hyatt is a sophomore in philosophy and political science. Jack Palmer is a freshman in computer science. editor volunteers to write the article. The opinions expressed by the Editorial Board do not necessarily represent the opinions of the IDS news staff, student body, faculty or staff members or the Board of Trustees. LETTER TO THE EDITOR POLICY The IDS encourages and accepts letters to be printed from IU students, faculty and staff and the public. Letters should not exceed 350 words and may be edited for length and style. Submissions must include the person’s name, address and telephone number for verification. Letters without those requirements will not be considered for publication. Letters can be mailed or dropped off at the IDS, 601 E. Kirkwood Ave. Bloomington, IN 47405. Send submissions via e-mail to letters@idsnews. com. Call the IDS with questions at 812-855-0760. Right Pete Buttigieg, mayor of South Bend, Indiana, kisses his husband, Chasten, on April 14 in Studebaker Building 84 located in South Bend, Indiana. Glezman walked out to see Buttigieg after he officially announced he is running for President in 2020. Left People hold signs for Mayor of South Bend Pete Buttigieg on April 14 in Studebaker Building 84 in South Bend, Indiana. Buttigieg announced he was running for president in 2020. CONTINUED FROM PAGE 1 the third inning with a RBI single to left field to score freshman outfielder Grant Richardson. Ashley went 2 for 5 with a run batted in during his first game back in Evansville. Senior utility player Matt Lloyd added a second run in the fourth inning with a solo bomb to continue his hot streak as of late. With Milto cruising, sophomore infielder Justin Walker added a two-run single en route to a 5-0 final score Friday night. On Saturday, the two teams moved things north to Bloomington for a doubleheader. IU junior Tanner Gordon got the ball in game one and didn’t disappoint. spoke to the importance of local leadership. Buttigieg frequently notes the importance of creating policies that will be relevant in 2054, the year he will reach the age of President Trump. “This time calls for a new generation of leadership in our country,” he told the crowd. South Bend residents Angie Faccenda and her husband Phil have known Buttigieg personally since he ran for state treasurer nine years ago. “He’s done a lot for us in South Bend,” Faccenda said. The couple snapped a selfie in front of the Pete 2020 backdrop as they waited for the program to begin. Faccenda said she thinks people will appreciate that Buttigieg is an underdog. “He’s not just South Bend,” she said. “He’s not just Indiana.” Standing in a building that was once a symbol of his city’s decline, Buttigieg told the crowd how running for office is an act of hope. Supporting someone running for office is an act of hope, too, he said. “Let’s get to work, and let’s make history,” he said. Cole Barr added some insurance in the seventh with a two-run double to give IU the 5-1 victory in game one of the doubleheader. giving up two earned runs. Freshman outfielder Grant Richardson had three runs batted in while junior utility player Scotty Bradley and Walker both had two. IU’s offense produced more than enough for Saalfrank as IU coasted to a 9-3 victory and a clinch of a series win in the four-game set. IU capped off an impressive weekend Sunday with a 6-5 walk-off victory. IU got a combination of help from different players on a rainy, gloomy day to cap off the series sweep. Ashley’s tenth inning hit ended the series. The Hoosiers are now 2412 overall and 7-2 in Big Ten play. IU will host Ball State University at 6:05 p.m. Tuesday at Bart Kaufman Field. ing process, Oliphant said. Oliphant said workers come in around 10:30 p.m. Saturday and work all the way to Sunday morning. There were 12 who worked the overnight shift. Because of the lower numbers of citations, some workers got to go home earlier than usual, she said. By 10 a.m. most of the workers were leaving the justice building. “It was a relatively easy day,” Oliphant said. Senior Matt Gorski hits the ball April 14 at Bart Kaufman Field. IU played University of Evansville four times this weekend, winning all four games. Browse housing options located on campus and off with LiveInBtown.com. Organize your results based on location, price, size, amenities and more! Riders of Teter Cycling line up for a victory lap April 14 at Bill Armstrong Stadium after winning the 2019 women’s Little 500. Cutters line up for its victory lap Saturday at Bill Armstrong Stadium. 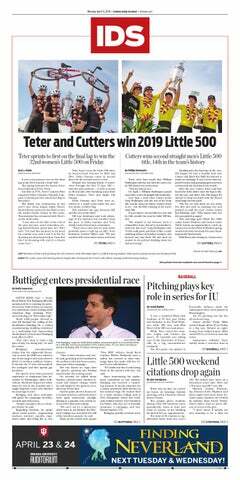 Cutters are back-to-back champions for the Little 500 claiming the title in both the 2018 and 2019 races. line, he told Huibregtse that the win was for his father. “It’s been a really heavy week with the excitement of race day and losing a family member,” Guyon said. “We just wanted to support him all week and on race day. We really wanted to win it for his dad. We know he would’ve loved to have been here to watch him do it.” Editors note: Noble Guyon has worked for the Indiana Daily Student. Jackson Creek Dental Mon. - Fri.: 7 a.m. - 5 p.m. 1124 S. College Mall Road 812-336-5525 jcdsmiles.com Jackson Creek Dental is a privately owned dental practice conveniently located on South College Mall Road. Most insurances accepted, including the Indiana University Cigna Insurance plan as well as IU Fellowship Anthem. Dr. Tschetter offers state of the art dental technology such as Zoom whitening, same day crown appointments, and Invisalign. Dr. Tschetter also provides restorative, cosmetic and emergency care. We pride ourselves in giving the best care to our patients while offering a pleasant yet professional atmosphere. For membership in the Indiana Daily Student Health Directory, please contact us at ads@ idsnews.com. Your deadline for next Monday’s Health Directory is 5 p.m. Wednesday. Campus Family Dental is the preferred choice for dental care among many IU students and professors. We will work with your schedule to provide the highest quality of general dentistry services. We pride ourselves in our professionalism and high-tech equipment to make your appointments as comfortable and efficient as possible. Enjoy the convenience of walking to our office. We are located near the southeast corner of campus and accept many forms of insurance. Mon. - Wed.: 8 a.m. - 5 p.m. (Closed 1-2 p.m. for lunch) Thu. : 8 a.m. - 2 p.m.
Jackson Creek Dental Ryan D. Tschetter, D.D.S. A privately owned, people-oriented practice located next to the College Mall. Dr. Davis provides cosmetic, restorative, family and emergency dentistry in a comfortable, relaxed atmosphere with a caring, knowledgeable and experienced staff. We use Cerec technology, allowing us to make restorations in one visit. Dr. Davis is a provider for Invisalign, Zoom! and Under Armour Performance Mouth Guards. Also offering other advanced services. We look forward to getting to know you and take care of you and your entire family with the goal of improving your smile and dental health. Jackson Creek Dental is a privately owned dental practice conveniently located on South College Mall Road. Most insurances accepted, including the Indiana University Cigna Insurance plans as well as the IU Fellowship Anthem. Dr. Tschetter offers state of the art dental technology such as Zoom whitening, same day crown appointments, and Invisalign. Dr. Tschetter also provides restorative, cosmetic and emergency care. We pride ourselves in giving the best care to our patients while offering a pleasant yet professional atmosphere. Dr. Crystal Gray Dr. Andrew Pitcher Gentle, effective chiropractic care helping students reduce back and neck pain, stress, headaches, migraines, fatigue, sports injuries, whiplash, etc. We have treatments that will fit your individual needs. We accept most insurance plans. Give us a call today! Consultations are always complementary. Mon., Wed., Thu. : 9 a.m. - noon, 2-7 p.m. Tue., Fri.: 8 a.m. - 1 p.m. The Health Directory is your guide to health and wellness in the Bloomington area. The Teter Cycling team poses with its awards Friday at Bill Armstrong Stadium. Teter Cycling won the 32nd women’s Little 500. Senior Noble Guyon crosses the finish line for the Cutters, winning the 2019 men's Little 500 on Saturday at Bill Armstrong Stadium. Riders in the women’s Little 500 riders round the first turn April 12 at Bill Armstrong Stadium. Teter Cycling went on to win the race. The Delta Gamma Coach holds up a sign during the second-to-last lap of the women's Little 500 race Friday at Bill Armstrong Stadium. Delta Gamma placed second. The Borg-Warner Trophy sits on the track Saturday before the 2019 men’s Little 500 at Bill Armstrong Stadium. Cutters won the trophy for the 14th time in Little 500 history. Riders for Delta Gamma regroup April 12 at Bill Armstrong Stadium after placing second in the 2019 women’s Little 500 race. Delta Gamma fell short of first place. Alpha Chi Omega cheers on its team as it is announced during the opening ceremony Friday at Bill Armstrong Stadium. Alpha Chi Omega placed fourth in the women’s Little 500. Members of Teter Cycling trade off bicycles during the Little 500 women’s race April 12 at Bill Armstrong Stadium. The team edged out Delta Gamma and SKI in the final laps to win first place. Multiple riders crash at turn one Saturday during the 2019 men’s Little 500 race at Bill Armstrong Stadium. Riders prepare themselves for the upcoming women’s Little 500 race Friday at Bill Armstrong Stadium. There was a parade of riders from every team before the race began. The Cutters kiss and hold its trophies after winning the men’s Little 500 race Saturday at Bill Armstrong Stadium. Senior Haley Harris, No. 4, waits before the start of the women’s 1-mile run Jan. 26 at the IU Relays at Gladstein Fieldhouse. IU competed in the Tennessee Relays on Friday and Saturday in Knoxville, Tennessee. Then-sophomores Caitlin Bernard and Natalie Whalen celebrate after defeating their opponents in a doubles match Feb. 18, 2017. IU lost to Ohio State on Sunday, 6-1.
the women’s 4x800, women’s 4x200 and the women’s distance medley relay. The Hoosiers are set to compete in three meets next weekend, including the Cardinal Classic, the War Eagle Invite and the Kentucky Open. regular season. IU stands at seventh overall in the conference standings but has yet to lock up a spot as one of ten teams to compete in the Big Ten Tournament in Lincoln, Nebraska, from April 25-28. IU will play Rutgers at 11 a.m. April 20 and Maryland at 11 a.m. April 21 at the IU Tennis Center to conclude its regular season. and junior Evan Gaesser. Brown placed in the top 50, tied for 42nd, while Gaesser fell just outside, tied for 58th. The players ended with a score of two-over par and five-over par, respectively. Freshman Harry Reynolds and sophomore Ethan Shepherd were the bottom finishers for IU. Shepherd was the furthest back, placing tied for last in the field shooting 11-over par. Reynolds placed a little higher than his fellow underclassmen, finishing tied for 71st. Reynolds shot nine-over par. Out of the 15 schools attending, IU placed above only Northern Illinois University and Miami University. Northwestern and the University of Oklahoma were the only teams in the field ranked in the top 50. The Hoosiers are ranked 98th in the nation. The Hoosiers will pick up their clubs again next weekend as they head to Iowa City, Iowa for the Hawkeye Invitational. idsnews Get breaking news alerts from the IDS Facebook Messenger. Search @idsnews in the Facebook Messenger app. Henry Miller and other student actors prepare themselves on Monday’s dress rehearsal for "Wonderful Town," which opens April 12 at the Ruth N. Halls Theatre. The musical delves into the bright, colorful life of 1950s Greenwich Village, New York. What exactly is traveling, anyway? An analysis of traveling's intent Anna Groover is a junior studying English, geography and religious studies. A tapestry called, “The Lady and the Unicorn,” is displayed Jan. 28 along with text in French that says, “My sole desire." The tapestry is on display at the Musée de Cluny - Musée nationale du Moyen Âge, or the Cluny Museum - National Museum of the Middle Ages, in Paris. at $17 for IU Bloomington students and children and $29 for the general public. Tickets can be purchased online or at the IU Auditorium box office. “I think that adults are going to expect to be moved and reminded to play and not take anything too seriously, but enjoy the little things,” Edler said. about the good things about her height and the things only she can do because of it, making the girl excited to go to school again. The book is currently available for preorder on Amazon. The story was inspired by real life. Two years ago, Orlinsky’s then-3-year-old daughter Hayley told her she didn’t want to go to school anymore because she was the shortest kid in class. When Orlinsky tried to find a children’s book to teach Hayley about the good things about being short, she couldn’t find one. So, she decided to write one, hoping it would help her 3-yearold daughter Ellie in the future as well. Orlinsky said the process of writing and publishing a book was long, overwhelming and incredibly frustrating at times. child looks like me, and I like the decisions she made." Orlinsky said children need to see characters in books they can relate to who model positive behavior. “Often times, children take cues from the books they read,” she said. “If I can convince just one child who feels different that it is precisely these differences that them special, then that's success to me.” She says that in a world with violent video games and entertainment content not always suitable for kids, story time becomes an important safe space and intimate bonding experience in the parent-child relationship. “‘Being Small’ can help engage conversations about feelings and how our words can impact others,” she said. IU journalism alumna Lori Orlinsky’s first children’s book, “Being Small (Isn’t so Bad After All),” will be released April 16. Campus Craves organized a meet and greet with former contestant on "The Bachelor" Ben Higgins from 5 to 7 p.m. April 10. The meet and greet was a benefit event for the Riley Hospital for Children and IU Dance Marathon. Horoscope Aries (March 21-April 19) — Today is a 9 — Your work is in demand. Don't get sidetracked. Avoid risky business, and stick to practical priorities. Plan actions before launching. Research before committing. Taurus (April 20-May 20) — Today is a 7 — Romance blossoms today and tomorrow. Think things over before acting. Get family aligned on the plan you're considering. Strengthen foundational structures. Build for love. To get the advantage, check the day’s rating: 10 is the easiest day, 0 the most challenging. Gemini (May 21-June 20) — Today is a 7 — Discipline with planning and preparation supports your home renovation projects. It's too early to tear things apart. Figure out where everything will go first. Cancer (June 21-July 22) — Today is a 7 — Edit your work before submitting. Consider the context and tone. Distractions abound. Focus to meet deadlines. Preparation and organization pay off in spades. Leo (July 23-Aug. 22) — Today is an 8 — Review accounts and budgets before committing to new expenses or purchases. Monitor cash flow for positive growth. Organize for clarity. Avoid shortfalls through advanced planning. Virgo (Aug. 23-Sept. 22) — Today is an 8 — Revise personal plans for shifting circumstances. Build strength to grow options. Self-discipline serves you well. Consider long-term visions. List steps to steadily create that new reality. Pisces (Feb. 19-March 20) — Today is a 6 — A partner's opinion is important. Listen to another perspective on a shifting situation. Hold your commentary until you have all the facts. Keep your promises. Difficulty Rating: How to play: Fill in the grid so that every row, column and 3x3 grid contains the digits 1 through 9, without repeating a number in any one row, column or 3x3 grid. Aver’s Pizza Now Hiring. Bloomington’s Original Gourmet Pizza To Go, Since 1995. Managers, Servers, Delivery Driver, Cooks & Dishwashers. Apply Online: averspizza.wyckwyre.com Bicycle Garage, Inc. is seeking enthusiastic, passionate, part-time Bicycle Mechanics and Sales Team members. We offer flexible hours and special savings on the products we carry. Apply online at: bikegarage.com Document storage warehouse position available, repeated lifting of 35+ pounds, computer skills. PT or FT, $15/hr. FT benefits: Health insurance, retirement plan, holiday pay, earned time. 812-322-1577 Locally owned roofing company looking for motivated, physically fit workers for summer of 2019 (May 13-Aug 23). Outside work on or near Campus, no experience needed, starting pay $15/hr. Send resume or inquiries to Betty at: steves@bluemarble.net LOOKING FOR SUMMER WORK? Full-time positions avail. at Nature’s Way Inc. Call: 812.876.7888 or email: victoria@naturesway.net for more information. 1-5 BR. Close to Campus. Avail. immediately. Call: 812-339-2859. 121 S. Jefferson St. $1200/mo. 3 BR/2 BA. Call Logan at: 812-598-8308. 3 BR, 1 BA. Close to Campus. $800/2 person, $900/3 person. + util. Avail. 8/20. 812-824-9735 338 S. Madison St. $1200/mo. 3 BR/2 BA. Call Logan at: 812-598-8308. Apt. Unfurnished 718 1/2 E. 8th Street $850/mo., studio. Call Logan at: 812-598-8308. 319 N. Park St. $900/mo,. studio. Call Logan at: 812-598-8308. Houses ***Now leasing 19-20*** HPIU.COM 2 BR apt for $860. Water incl. 3 blocks from Informatics. 812-3334748 No pets please. ONLINE POSTING: All classified line ads are posted online at idsnews.com/classifieds at no additional charge. PAYMENT: All advertising is done on a cash in advance basis unless credit has been established. The IDS accepts Visa, MasterCard, Discover, American Express, cash, check or money order. COPY ERRORS: The IDS must be notified of errors before 3 p.m. the date of the first publication of your ad. The IDS is only responsible for errors published on the first insertion date. The IDS will rerun your ad 1 day when notified before 3 p.m. of the first insertion date. REFUNDS: If you cancel your ad before the final run date, the IDS will refund the difference in price. A minimum of one day will be charged. COPY CHANGES: Ad copy can be changed at no additional charge when the same number of lines are maintained. If the total number of lines changes, a new ad will be started at the first day rate. HOUSING ADS: All advertised housing is subject to the Federal Fair Housing Act. Refer to idsnews.com for more info. AD ACCEPTANCE: All advertising is subject to approval by the IDS. ing hit down the right field line that put the final touches on an 8-0 run-rule victory over Maryland. “One of the greatest things we love as coaches is to be able to watch a kid have her moment,” Stanton said. “Brittany Ford really clutched up there and it was nice to see her smile coming around second.” The roles were reversed in game two as it was Maryland that jumped out to a first-inning lead, tagging IU junior pitcher Emily Goodin for three runs. A spirited comeback effort from the Hoosiers saw them plate two runs in the fourth inning, cutting the deficit to just one. runs on four hits. IU freshman pitcher Taylor Askland made her first appearance of the season in the fifth inning as she shut the door on an eventual 10-1 win and series victory. “The goal is always to take the series and I think the good thing is you get a little greedy and it’s never enough and you want more,” Stanton said. “But on the whole, really pleased with our ballclub to be able to bounce back from that first loss and we had some big moments from a lot of different kids.” Up next, the Hoosiers travel north to Madison, Wisconsin, to take on No. 25 Wisconsin. Bella Norton catches a pitch from Tara Trainer on April 12 in a game against Maryland. IU won the game 8-0. The Indiana Daily Student is an independent student newspaper covering Indiana University, IU sports and the city of Bloomington, Indiana.